I applied for a volunteer position on the FS’s Tongass Ranger in Alaska but didn’t really expect to get it. How could I make myself sound valuable without bragging? How much experience could I claim from one previous trip? After the shock of winning a bunk on the boat, I accepted the position with trepidation. With fear and trembling, I flew off by myself to Ketchikan. Sunday afternoon, I met the crew, which consisted of three archaeologists, five students, two Native guides, three other volunteers, and Captain Richard. The captain proceeded to give a lengthy dissertation on the rules of the boat. The basic rule was “No talking to the captain unless spoken to.” Detailed instructions on how to flush the head (toilet to landlubbers) followed. The only thing you were allowed to deposit into the maw of the rusted bucket was anything you had eaten first or toilet paper—nothing else. The confusing flushing procedure made me think it would be easier to use the side of the boat after midnight. He wound up with a story about accepting help when you need it, unlike a certain “middle-aged woman from the East Coast.” Since I was a middle-aged woman from the West Coast, I was only half offended. I looked around to see if anyone else was ready to make him walk the plank. No one seemed upset. It would be a long week, I decided. Captain Bligh had been reincarnated. On Monday morning, four volunteers filled the fo’c’sle with duffle bags and negotiated who would sleep in which bunk. It is a delicate art to negotiate with strangers. A nurse by profession, I would have had no problem asking if any of the volunteers needed a bottom bunk to allow them access to the head during the night. But as a genteel volunteer, I simply offered to take one of the top bunks. We moved on to drawer space, hanger space, etc. I made my bed with WWII vintage blankets and swept last season’s pea gravel out of my bed. No princess had slept here. After a four-hour trip on the Ranger, we embarked for shore on our two skiffs. Esther Shea, our Native elder, instructed us on the correct procedure for skinning tree bark just short of inflicting harm. We were tutored in the art of peeling and splitting bark by Kathy Rado, a skilled cedar-bark weaver. I noticed the peeling and splitting of my fingers as we worked, but I was in Alaska, where the sky is bigger, the trees are taller, the ferns are greener, and my spirit soared. After we dispensed with dinner dish duty, we gathered around the table in the galley to listen to Esther discuss the yearly Tlingit food cycle. 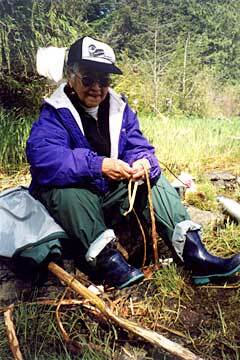 She fascinated us with tales of smoking salmon “600 at a time in the smokehouse” and stripping tree bark as a child: “It was fun; we fell into the moss and laughed. The whole family participated.” Her soft voice, accompanied by graceful gestures of her diamond adorned fingers, demanded our attention as she talked. She bore no evidence of arthritic knuckles or wrinkles. Why hasn’t Estee Lauder investigated the benefits of seal oil, I wondered? We retired to our bunks, where the steady hand of the ocean rocked us to sleep. The days fell into a routine. We needed no alarm to awaken us, as the generator kicked in with a growl at 5:15 a.m. Within minutes we had hot water, coffee, and heat. After dressing in my heaviest fleece, two pairs of wool socks, rubber boots, and Gore-Tex, I greeted the day. We shuffled into the kitchen, where a lavish repast of hot oatmeal, fresh fruit, warm cinnamon rolls, orange juice, milk, and a bottomless coffee pot surprised us. Thirteen of us bumped and ducked our way around each other as we took turns making sandwiches for the day’s foray onto the beach. Once in the field, we split into teams and variously mapped, measured, established compass points, and surveyed for pothunter damage. I was ecstatic on finding a “CMT”—a culturally modified tree. More measuring and cataloging ensued. We gathered for lunch around a driftwood campfire. A nearby tide pool revealed orange and purple starfish. Sara Mazurowski’s delight entertained us. Dan Monteith, one of our archaeologists, harvested goose tongue and beach asparagus for each of us to taste. I determined that beach asparagus was reminiscent of chives and spinach and, yes, a little like asparagus. 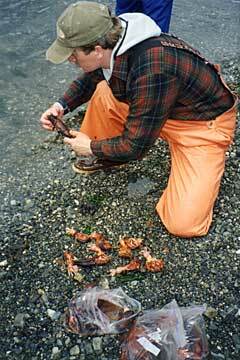 We gathered gumboots and sea cucumbers and roasted their skins in our beach fire. The gumboots were aptly named. The cucumber skins provided exercise for the jaws. Priscilla Schulte, our anthropologist, and Esther harvested cellophane-thin seaweed for drying. “Like potato chips, only better,” they said. I remained skeptical after the sea cuke skins. Kathy Rado and Esther split and finished cedar bark strips into precise thin strands for weaving. Esther patiently guided my clumsy fingers and my crude mat took shape. My unskilled fingers worked diligently, but my mat wandered from rectangular to, well, rhomboid. Esther pronounced it “pretty good.” I thought of the Tlingits and their mats made into clothing, shelter, and waterproof baskets. I looked on this accomplishment with more satisfaction than an afternoon of creating memos at my desk in Idaho. Captain Bligh communicated with us by eye rolls, scowls, and hands-on-hips huffs. Occasionally, a twinkle in his eye and a barely discernible upturned corner of his mouth indicated that this was all posturing. No mutiny would be necessary. He betrayed his gruffness by revealing the candy drawer—all the bars anytime you wanted. Mom would have scowled, but not our captain, who had no regard for cavities. Hollywood could have created our last day. The sun shined, the sky rid itself of unnecessary clouds, the wind slept, and the mosquitoes took a holiday somewhere else. I lolled on the beach making a whistle out of a hollowed branch under Phil Rumpel’s guidance. We puzzled over the aerodynamics of why it wouldn’t whistle. John Autrey, our leader, pointed out fresh bear tracks. Dan displayed his skill diving into the underbrush. Kathy Holcomb patiently sorted the seaweed crop drying on a log. Kathy Rado wove cedar bark into a bracelet. Matt Wolf, our teenager, dozed on a beach log. 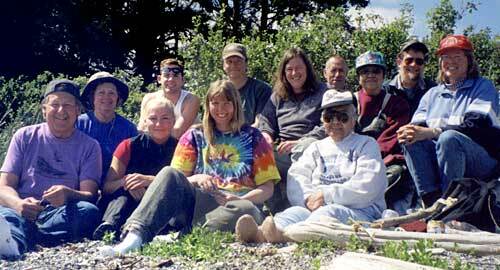 Later, I walked alone on the point of Village Island, one time home to 17 Tlingit houses. Did they spend these halcyon days in the same manner long ago? Kelp popped beneath my feet. Blue sky enveloped me. I prodded a tide pool’s residents with a driftwood stick and watched them scurry into new hiding places. Esther silently surveyed our crew from her beach log throne. Captain Richard (I no longer referred to him as Bligh) delivered a skiffload of picnic supplies, including burgers, hot dogs, salads, and a chocolate cake. We feasted, joked, wandered, and exclaimed about the perfect day. After roasting hot dogs on a driftwood fire, we reluctantly packed up and headed for our last night on the Ranger. I had dismissed a sore throat for days but finally succumbed to full-blown laryngitis. Squeaking and straining to talk, I refused to retire to my bunk on this last golden evening. Several of us gathered in the galley awaiting the end of the day before the silenced generator sent us to bed. Captain Richard appeared from the wheelhouse and offered me a cup of tea fortified with honey. Next he produced a box of chocolate Frango mints from the engine room cache for all of us to share. I realized why the engine room and its “dangerous machinery” had been declared off limits to us. We reveled in a cocoa-butter feast. I imagined the Tlingits feasting on seal oil and goose tongue, laughing and telling stories around their driftwood beach fires. How much has human behavior changed from previous millennia to the present despite differences in what we wear, what we eat, and what structures we live in? On Friday, we dispersed to our various lives and duties amid awkward good-byes. I trudged up the ramp to the waiting van with my duffle filled with dirty polar fleece protecting my cedar mat. Did the Tlingits regret leaving these idyllic islands at the end of summer as I did? My cedar mat is mounted above my desk in Idaho, a reminder of old ways revisited.